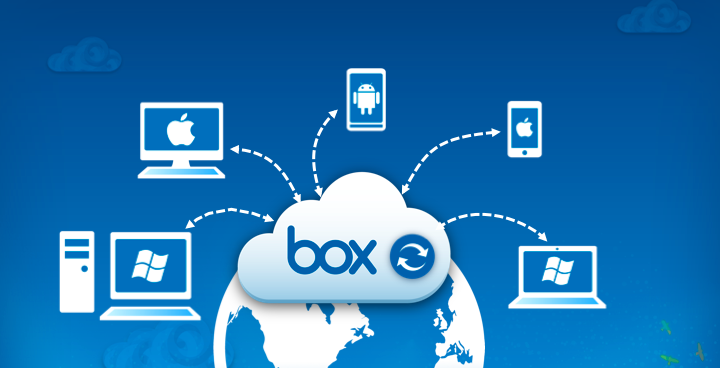 Box, if you haven’t used it, is a secure online collaboration site that allows you to upload, view and collaborate on files. Recently I deployed an Enterprise version of Box for a customer, and had a need to generate a report that showed when files were renamed by a specific user. This report needed to be run on a schedule, so the out-of-the-box reports, whilst useful, would become tedious to run all the time as they require a person to run them. To make this report happen, I looked into using the Box api from Go. This post covers off what I’ve learned from the process, whilst also giving you some code to have a look through as well. To get started, I would recommend that you have a read through these following links to get an idea of whats involved. So Box talks about using two authentication types depending on whether you want to build a Box Integration, or whether you want to access the Box Platform. The first authentication approach uses standard oAuth 2, sometimes known the 3-legged-version authentication, whereby you receive a web-page back from Box and then you click on a button to authorise an applications access to you Box account. The second approach is server-to-server authentication using JSON Web Tokens (JWT) which removes the need for the manual, button clicking interaction. I wanted to go with this approach as we don’t want use interaction in the app. 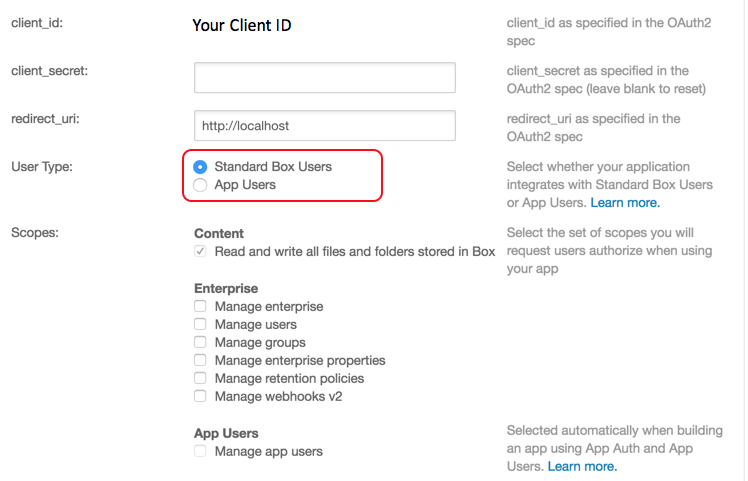 OAuth 2 requires a user to log in to Box and grant your application permission to access files and folders.The OAuth 2 standard defines athree-legged authentication process; Box conforms to this process. The Box implementation of OAuth 2 is designed to be used with managed users and external users. An external user is an account created by a Box user for that person’s own use. 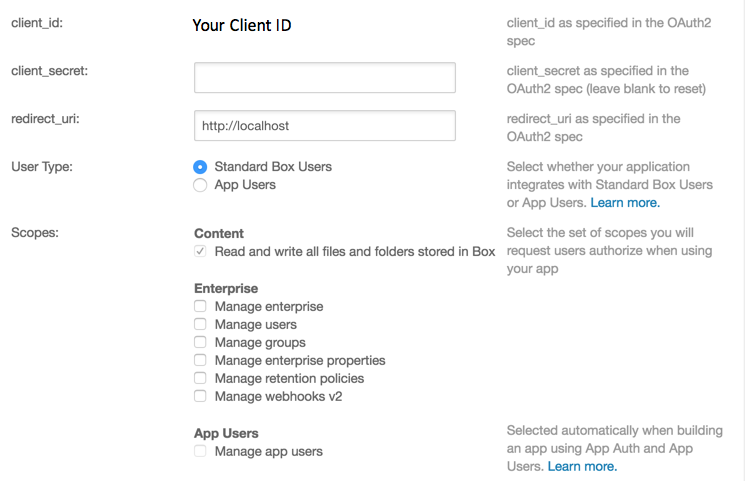 OAuth 2 with JSON Web Tokens (JWT) enables an application to connect directly to Box and obtain authorisation to access files and folders without requiring users to log in. Using OAuth 2 with JSON Web Tokens an application can provide Box features without users even being aware that Box exists. Instead of requiring the user to log in to Box, the application generates JSON Web Token (JWT) verified by an RSA key pair. If this authentication succeeds then the application obtains an access token that grants authorisation to operate on Box files and folders. This machine-to-machine authentication replaces the first leg of the three-legged authentication process defined by OAuth 2, and enables users of your application to work with Box content without seeing Box login requests. For the purposes of not wasting your time, it appears that the 3-legged oAuth approach is the only show in town that will give you full functionality. to access Box events. Needless to say, I’d progressed quite a bit with the JWT approach before understanding this condition. Unfortunately the above constraint does inflict upon you the unique scenario whereby you have to authenticate your app manually, and then rely on refresh tokens to ensure that you can still access your account via your app. When I say manually, I mean that you have to acknowledge the standard oAuth webpage you get sent back when your app tries to access an oAuth protected site. This is a bit crap. If you’re still interested in the JWT approach (and a look at the code I’ve created), keep reading, otherwise I would recommend you have a look at the Box SDK, specifically around the refresh token approach. Keep your private key safe. Note, I didn’t add a password to the private key, but this can be done with the -pass argument. To get a look at the code, check out the following linkhttps://github.com/daveym/box-reporter. The main things to note is that this is a command line app that uses theviper and cobra frameworks for parameter parsing. The following screen shots give you a bit of a run down on how things are constructed within the go app. 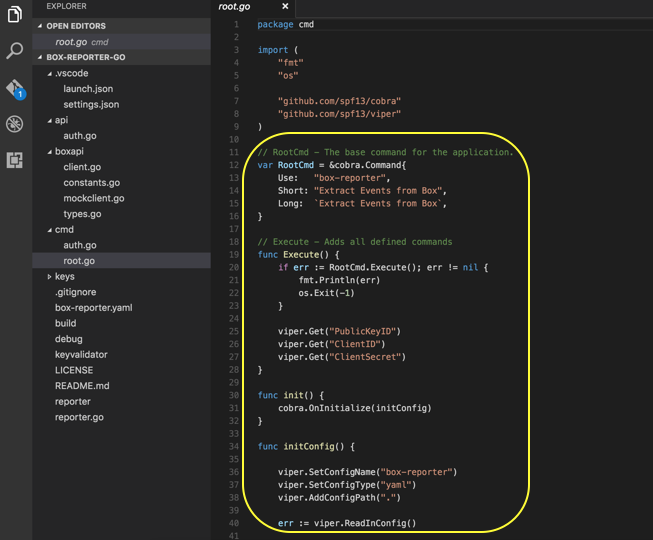 (As an aside, I’ve switched from Sublime to VSCode for Go work — its come on so much and is really useful now). Reporter.go is the main entry point to the application, and basically executes and sets up command line parsing. Under the cmd folder, you’ll see a root.go and an auth.go file. 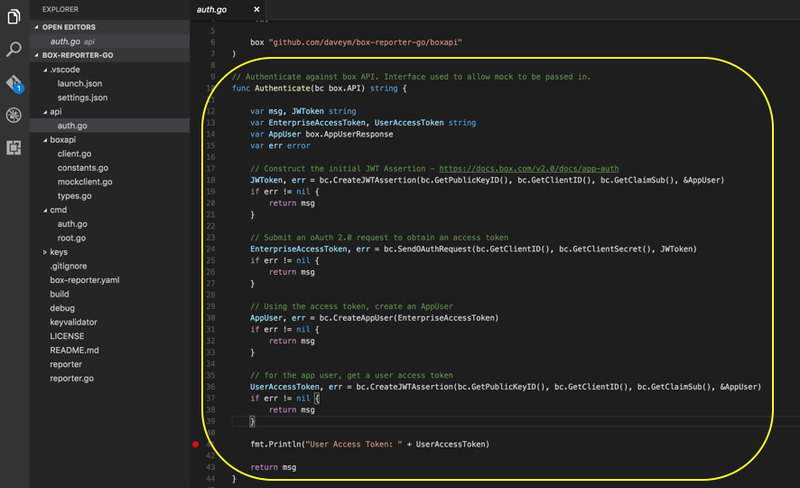 Root will always get executed, and auth.go corresponds to passing in an auth parameter to the reporter executable, i.e. I’ve constructed the app to have an API for its own use, that pretty much corresponds to each of the parameters that you can pass in. In this case, the auth parameter will correspond to an auth.go file in the api folder. 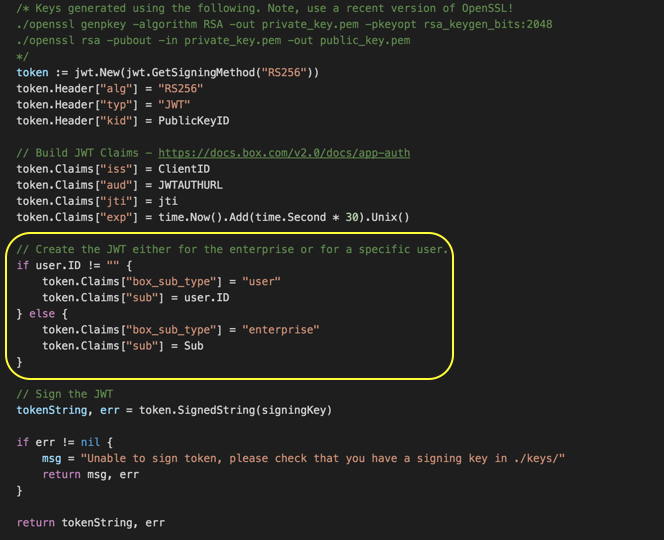 Create the JWT, passing in the public key ID, Client ID, Claim Sub and whether this is an enterprise token or an app user token (* see below). At this point I use a Go Wrapper I’ve created for the Box api, under the box api folder. The main points to this are the the Authenticate method takes in a box client. This can either be an instance of the client itself, or a mock version that can be used for unit testing. The mock client must have the same signature as the main client for it to be passed in correctly. Once you get the token back, I build an oAuth request, that again passes in the clientId, Secret and the JWT we got in step one. This returns an enterprise access token that we can use to create an App User. This is where it gets a bit interesting, because when you get to it, and App user cannot get access to the any events in Box, despite previous documentation implying this. Remember this screenshot? Well if you select App users, you explicitly cannot manage enterprise events. You have to use a standard box user type which is the crux of this post, sadly. User types — App Users can’t actually manage the enterprise. 4. Finally, when you get an App User back, you need to create an access token on behalf of that user. This is where I am reusing the method to create the JWT, except in this case instead of creating an enterprise token, we create an App User token. At this point, I’ve decided to hold off on further Go work against Box as we needed to progress quickly, but hopefully you’ll find this useful if you want to use Go yourself with Box. On another note, I did speak to Box directly about the confusion in their documentation, and they had responded that their enterprise API is undergoing some work at present, and to use the standard oAuth rather than server-to-server validation. A colleague of mine is progressing things with the Java SDK and manual oAuth and I’ll see if I can coax him to share his thoughts on it as well. This entry was posted in Uncategorized by daveym. Bookmark the permalink.